Some of us go through life knowing what we are meant to do. It is almost like a calling or an internal compass the drives us forward. Call it passion, destiny, whatever it may be. Please join my very special guest, Dr. Punam Chowdhury, as she shares her experience of healing communities of need through out the world. 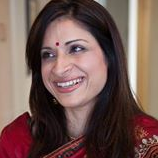 Hosts: Christina Souza Ma with special guest Punam Chowdhury – airing on Wednesdays @ 11am PT (2pm ET). One Response to "77: Global Healing"